New Zealand-born Jill Rogoff lives in Jerusalem. With a growing international reputation for sensitive interpretation of traditional music, her hallmark clear soprano voice explores an uncommonly wide repertoire from the British Isles - lyrical songs, ballads and other genres -- to material from the depths of the Celtic tradition (in the original languages) and choice contemporary offerings. In recent years, she has also begun to enrich her programs with medieval and Renaissance music. Her interpretation of traditional Sephardi music is earning her a place of considerable respect in the Israeli Sephardi community. In addition, she writes songs and has also set to music poems in several languages. For many years, Jill appeared at Jacob's Ladder Folk Festival, the national folk-music event in Israel, and the Abu Ghosh Vocal Festival, and has sung on Israel National Radio on many occasions. While she usually sings solo, she has sung with a wide range of musicians in Israel and Great Britain. Her recent tours in North America, Europe, Australia and New Zealand have all been highly successful. In 1998 she sang Schubert lieder in a series of concerts in Israel and has continued her classical music studies with Judi Axelrod, Neil Jenkins, Philip Griffin, Evelyn Tubb and Anthony Rooley, Poppy Holden and Margaret Peckham. Her study of early music has continued with participation in international workshops in Europe with The Dufay Collective, Vivien Ellis, Sirinu, Shira Kammen, members of the Boston Camerata, Marcin Bornus-Szczycinski and Oswald Hebermehl. Having completed two years of Ladino study, Jill is now exploring the world of Sephardi romansas (old ballads), which she hopes to record in the future. She is already incorporating the completed editions in her concerts. Jill recorded five new Ladino songs for a compilation album, Di Ke No Es Tadre, which was released in 2002 to international acclaim. Jill was a founding member of the IFS, the national folk music association in Israel, and was editor of its monthly publication, Folk Notes, for a year. She is also a founding member of Nevel: the Jerusalem Harp Network, formed in 2002. "...there is such emotional wisdom in her lyrics -- personal, yet universal!" " A beautiful production in every respect -- from the outside cover to the last note on the inside." " I've been playing it and playing it and playing it: it's brilliant. " " The result is beyond anything I could have expected, and my expectations from Jill's recordings are never low. " " Jill has truly given of her spiritual being to these songs and we are the richer for being able to hear them. I am always deeply moved when I listen to the Ladino CD and this latest one sends me down my own memory trail... "
" Jill's new cd is superb. The words are very touching; the music, as always, is wonderful. " "It's a very gentle and personal statement that she's done. Her music is very special." "Such a treat... I love it! It is so nice to have all her wonderful songs." A wonderful combination of lively music and rich poetry. 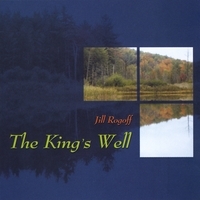 “This is a wonderful recording of eleven songs, mostly with words and music by Jill, the others being poems or traditional songs set by Jill to her music. It is a combination of lively music and rich poetry. The songs -- beautifully arranged -- display a range of musical styles with medieval, Celtic, and Ladino influences. There are songs of protest, elegies for people and places, meditations on life lessons and healing songs. The songs are personal, yet universal, with a range and depth of feeling. Some of the songs treat difficult subjects but have a grace that is redemptive. Jill’s clear voice is a constant: strong and warm. Many of the songs stem from Jill’s life: her childhood and youth in New Zealand, her adult life living on the edge of the desert in Jerusalem, Israel, and her children. The Healing Sound of Water -- One of the healing songs. Aa My Life -- Jill's setting of a Sydney Goodsir Smith poem celebrating life-long love. La complainte de la Blanche Biche (the Lament of the White Doe) -- Jill's setting of a haunting traditional French poem that reminds us of how we often unknowingly harm those we love... and of how we often harm our own souls without realizing what we are doing. Come Again, Love -- An elegy which must touch the heart of anyone who has ever waited for a loved one, not knowing if they would return safely. The King’s Well -- Another lyrical and wise healing song, with exhuberant, celebratory Latin rhythms and some wonderful guitar playing. Time for Letting go -- An elegy for place and people, and the need for letting go as life moves on. Down the days --­ A meditation on the necessity of leaving childhood behind as we move into adult life, and the difficulty of passing on life’s lessons to those we would like to help. The Route March­ -- A protest song, with the fifes and drums of war in a song for peace. Henry Lawson's poem reminds us of the consequences of war after the pageantry that accompanies troops going off to battle. Racheli -- A poignant and beautiful elegy in memory of a friend of Jill’s daughter who was killed in a suicide bombing in Jerusalem. A Piece of My Heart --­ A love song to those we love who are far away a piece of our hearts. Identities­ -- A fierce, humorous, cultural protest song with Latin rhythms about hateful ideologies and mindless materialism.